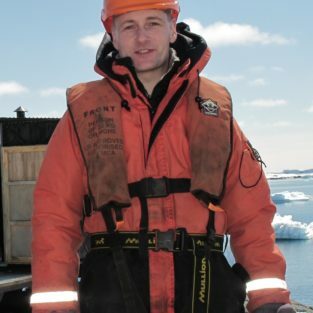 Professor Mike Meredith is an oceanographer and Science Leader at the British Antarctic Survey (BAS) in Cambridge, UK. He is head of the Polar Oceans team at BAS, which has research foci on determining the role of the polar oceans on global climate, the ice sheets, and the interdisciplinary ocean system. He holds an honorary Chair at UHI, is a fellow of the Royal Meteorological Society, and a NERC Individual Merit Promotion (Band 3) scientist. He led the design and delivery of the multi-institute, £10M ORCHESTRA programme, which is unravelling the role of the Southern Ocean in controlling global climate. He is currently Coordinating Lead Author for the IPCC Special Report on Oceans and Cryosphere in a Changing Climate. In 2018, Mike was awarded the Tinker-Muse Prize for Science and Policy in Antarctica, in recognition of his contributions to the study of the Southern Ocean and its global impacts. He was also awarded the 2018 Challenger Medal, for exceptional contributions to Marine Science. For more information about the science that Mike does, please read this article in the Cambridge Independent newspaper, or watch this presentation delivered at the California Institute of Technology. 2009 – present: Science Leader, British Antarctic Survey, Cambridge, U.K.
2012 – present. NERC Individual Merit Promotion 3. 2013 – present. Professor, UHI. Scottish Association for Marine Science, Oban, U.K.
2014 – 2016. Deputy Director of Science, British Antarctic Survey, Cambridge, U.K.
2004 – 2009: Head of Atmosphere & Ocean Group (UG7), British Antarctic Survey, Cambridge, U.K.
2002 – 2004: Senior Scientific Officer, Proudman Oceanographic Laboratory, U.K.
2000 – 2002: Senior Scientific Officer, British Antarctic Survey, Cambridge, U.K.
1999 – 2000: NERC Research Fellow, University of East Anglia, Norwich, U.K.
1995 – 1999: Senior Research Associate, University of East Anglia, Norwich, U.K.
1990-1991, M.Sc., Oceanography, University of Southampton, UK. John Raymont Memorial Prize for best Masters’ degree performance. 1987-1990, B.Sc. (Hons), Physics, University of Southampton, UK. The role of the polar oceans in large-scale climate variability. Physical forcing of the marine ecosystem, and bio-physical interaction in the Southern Ocean. Climatic changes in Southern Ocean properties, circulation and fluxes. Dynamics and variability of the Antarctic Circumpolar Current and Southern Ocean overturning. The use of geochemical tracers in oceanography. The Arctic Ocean freshwater budget. Emerging technologies and their use in ocean observing systems. Webb, A.L., M.A. van Leeuwe, D. den Os, M.P. Meredith, H. Venables and J. Stefels. “Extreme spikes in DMS flux double estimates of biogenic sulfur export from the Antarctic coastal zone to the atmosphere”. Scientific Reports, 9:2233, 10.1038/s41598-019-38714-4, 2019. Meijers, A.J.S., M.P. Meredith, E.J. Murphy, D.P. Chambers, M. Belchier and E.F. Young. “Ocean dynamics in king penguin range estimation”, Nature Climate Change, 9, 120-121, 10.1038/s41558-018-0388-2, 2019. Cook, A.J., P.R. Holland, M.P. Meredith, T. Murray, A. Luckman and D.G. Vaughan. “Ocean forcing of glacier retreat in the western Antarctic Peninsula“. Science, 353, 6269, 10.1126/science.aae0017, 2016. Sheen, K.L., A.C. Naveira Garabato, J.A. Brearley, M.P. Meredith, K.L. Polzin, D.A. Smeed, A. Forryan, B.A. King, J.B. Sallee, L. St. Laurent, J.R. Ledwell, A.M. Thurnherr, J.M. Toole, S.N. Waterman and A.J. Watson. “Eddy-induced changes in Southern Ocean abyssal mixing on climatic timescales”. Nature Geoscience, 10.1038/ngeo2200, 2014. Rye, C.D., A.C. Naveira Garabato, P.R. Holland, M.P. Meredith, A.J.G. Nurser, C.W. Hughes, A.C. Coward and D.J. Webb. “Rapid sea level rise along the Antarctic continental margins in response to increased glacial discharge”. Nature Geoscience, 10.1038/ngeo2230, 2014. McCave, I.N., S.J. Crowhurst, G. Kuhn, C-D. Hillenbrand and M.P. Meredith. “Minimal change in Antarctic Circumpolar Current flow speed between the last glacial and Holocene”. Nature Geoscience, 7, 113-116, 10.1038/ngeo2037, 2014. Watson, A.J., J.R. Ledwell, M.-J. Messias, B.A. King, N. Mackay, M.P. Meredith, B, Mills and A.C. Naveira Garabato. “Rapid cross-density ocean mixing at mid depths in Drake Passage measured by tracer release”. Nature, 501, 408-413, 10.1038/nature12432, 2013. Meredith, M.P. “Replenishing the abyss”. Nature Geoscience, 6, 166-167, 10.1038/ngeo1743, 2013. Schofield, O., H.W. Ducklow, D.G. Martinson, M.P. Meredith, M.A. Moline and W.R. Fraser. “How Do Polar Marine Ecosystems Respond to Rapid Climate Change?”. Science, 328, 1520, 10.1126/science.1185779, 2010. Swart, S., Campbell, E.C., Heuze, C.H., Johnson, K., Lieser, J.L., Massom, M., Mazloff, M.R., Meredith, Michael P., Reid, P., Sallee, Jean-Baptiste, Stammerjohn, S.. (2018) Return of the Maud Rise polynya: climate litmus or sea ice anomaly? [in “State of the Climate in 2017”]. Bulletin of the American Meteorological Society, 99. S188-189. Swart, S., Johnson, K., Mazloff, M.R., Meijers, Andrew, Meredith, Michael P., Newman, L., Sallée, J.-B.. (2018) Southern Ocean [in “State of the Climate in 2017”]. Bulletin of the American Meteorological Society, 99. S185-187, 190. Gille, S.T., Meredith, Michael P.. (2018) The Southern Ocean. In: Satellite Altimetry Over Oceans and Land Surfaces, Boca Raton, CRC Press, 297-314. Wiebe, PH, Atkinson, A, O'Brien, TD, Thompson, PA, Hosie, G, Lorenzoni, L, Meredith, M, et. al., . (2017) Southern Ocean. In: What are Marine Ecological Time Series telling us about the ocean? A status report, IOC-UNESCO, 97-112. Sallee, J.-B., Mazloff, M., Meredith, M.P., Hughes, C.W., Rintoul, S., Gomez, R,, Metzl, N., Lo Monaco, C., Schmidtko, S., Mata, M.M., Wåhlin, A., Swart, S., Williams, M.J.M., Naveria-Garabato, A.C., Monteiro, P.. (2016) Southern Ocean [in “State of the Climate in 2015”]. Bulletin of the American Meteorological Society, 97. S166-S168. (2016) International efforts to understanding of the changing Antarctic climate: The KOPRI expedition to the Amundsen Sea. Deep Sea Research II, 123. 144 pp. Meredith, M.P., Mazloff, M., Sallee, J.-B., Newman, L., Wåhlin, A., Williams, M.J.M., Naveira Garabato, A., Swart, S., Monteiro, P., Mata, M.M., Schmidtko, S.. (2015) Southern Ocean. Bulletin of the American Meteorological Society, 96. S157-S160. Watson, Andrew J., Marshall, John, Meredith, Michael P. (eds.). (2014) New models and observations of the Southern Ocean, its role in global climate and the carbon cycle. London, Royal Society, (Philosophical Transactions of the Royal Society A, 372, (2019)). Newman, Louise, Rintoul, Steve, Meredith, Michael P., Fahrbach, Eberhard, Gunn, John, Sparrow, Mike, Wadley, Victoria, Speer, Kevin, Hofmann, Eileen, Summerhayes, Colin, Urban, Ed, Bellerby, Richard. (2012) The Southern Ocean Observing System. CLIVAR Exchanges, 58. 49-53. Rintoul, Stephen R., Sparrow, Mike, Meredith, Michael P., Wadley, Victoria, Speer, Kevin, Hofmann, Eileen, Summerhayes, Colin, Urban, Ed, Bellerby, Richard (eds.). (2012) The Southern Ocean Observing System: Initial science and implementation strategy. Cambridge; UK, Scientific Committe on Antarctic Research; Scientific Committee on Oceanic Research, 74 pp. Rintoul, S.R., Speer, K., Sparrow, M., Meredith, Michael, Hofmann, E., Fahrbach, E., Summerhayes, C., Worby, A., England, M., Bellerby, R., Speich, S., Costa, D., Hall, J., Hindell, M., Hosie, G., Stansfield, K., Fukamachi, Y., de Bruin, T., Naveira Garabato, A., Alverson, K., Ryabinin, V., Shin, H.C., Gladyshev, S.. (2010) Southern Ocean Observing System (SOOS): Rationale and strategy for sustained observations of the Southern Ocean. In: OceanObs 09: Ocean information for society: Sustaining the benefits, realizing the potential. Vol. 2, Noordwijk, The Netherlands, European Space Agency, 851-863. (ESA Special Publication, ). Charrassin, J.-B., Roquet, F., Park, Y.-H., Bailleul, F., Guinet, C., Meredith, Michael M., Nicholls, Keith, Thorpe, Sally, McDonald, B., Costa, D.P., Tremblay, I., Goebel, M., Muelbert, M., Bester, M.N., Plötz, J., Bornemann, H., Timmermann, R., Hindell, M., Meijers, A., Coleman, R.C., Field, I.C., McMahon, C.M., Rintoul, S.R., Sokolov, S., Boehme, Lars, Lovell, P., Fedak, M.A., Biuw, Martin, Nøst, O.A., Lydersen, C., Kovacs, K.M.. (2010) New insights into Southern Ocean physical and biological processes revealed by instrumented elephant seals. In: Proceedings of OceanObs '09:Sustained ocean observations and information for society, Venice, Italy, European Space Agency, 9 pp. (ESA Publication, ). Boehme, Lars, Kovacs, K., Lydersen, C., Nøst, O.A., Biuw, Martin, Charrassin, J.-B., Roquet, F., Guinet, C., Meredith, Michael, Nicholls, Keith, Thorpe, Sally, Costa, D.P., Block, B., Hammill, M., Stenson, G., Muelbert, M., Bester, M.N., Plötz, J., Bornemann, H., Hindell, M., Rintoul, S., Lovell, P., Fedak, M.A.. (2010) Biologging in the global ocean observing system. In: Proceedings of Ocean Obs 09: Sustained ocean observations and information for society, Venice, Italy, European Space Agency, 9 pp. (ESA Publication, ). Reid, P.C., Fischer, A., Lewis-Brown, E., Meredith, Michael, Sparrow, M., Andersson, A., Antia, A., Bates, N.R., Bathmann, U., Beaugrand, G., Brix, H., Dye, S., Edwards, M., Furevik, T., Gangsto, R., Hatun, H., Hopcroft, R.R., Kendall, M., Kasten, S., Keeling, R., Le Quéré, Corinne, Mackenzie, F.T., Malin, G., Mauritzen, C., Ólafsson, J., Paull, C., Rignot, E., Shimada, K., Vogt, M., Wallace, C., Wang, Zhaomin, Washington, R.. (2009) Impacts of the oceans on climate change. In: Advances in Marine Biology, Academic Press, 1-150. Boehme, L., Lovell, P., Biuw, M., Roquet, F., Nicholson, J., Thorpe, Sally E., Meredith, Michael Paul, Fedak, M.. (2009) Technical note: Animal-borne CTD-satellite relay data loggers for real-time oceanographic data collection. Ocean Science, 5. 685-695. Hendry, K.R., Rickaby, R.E.M., Meredith, M.P., Elderfield, H.. (2009) Controls on stable isotope and trace metal uptake in Neogloboquadrina pachyderma (sinistral) from an Antarctic sea-ice environment. Earth and Planetary Science Letters, 278. 67-77. Holfort, Jürgen, Hansen, Edmond, Østerhus, Svein, Dye, Steve, Jonsson, Steingrimur, Meincke, Jens, Mortensen, John, Meredith, Mike. (2008) Freshwater fluxes east of Greenland. In: Arctic-Subarctic ocean fluxes: defining the role of the northern seas in climate, Dordrecht, Springer, 263-287. Boehme, L., Thorpe, S.E., Biuw, M., Fedak, M., Meredith, M.P.. (2008) Monitoring Drake Passage with elephant seals: frontal structures and snapshots of transport. Limnology and Oceanography, 53. 2350-2360. Boehme, Lars, Biuw, Martin, Fedak, Mike, Nicholls, Keith, Thorpe, Sally, Meredith, Mike. (2008) Animals as exploratory underwater vehicles. In: Workshop on AUV science in extreme environments: collaborative Autosub science in extreme environments. Proceedings of the International Science Workshop, Cambridge, 11-13 April 2007, London, Society for Underwater Technology, 55-62. Meredith, Mike. (2007) East Antarctic continental margin, oceanography of. In: Encyclopedia of the Antarctic, New York, Routledge, 359-364.